14 :: Gerrards Cross Golf Club is considered one of the most attractive courses in South Buckinghamshire. Kindly sponsored by Lofty Creations. 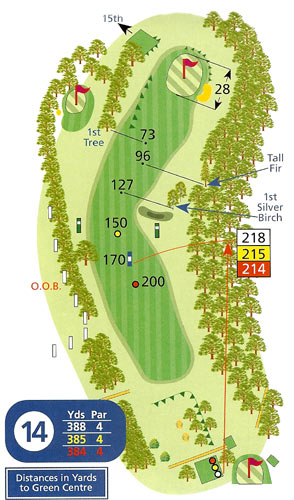 On this dog-leg right a long drive will be rewarded with an excellent view down the hill to an inviting green. The fairway slopes quite steeply from left to right near the green taking the ball towards a greenside bunker on the right. Approach shots to the safer left side can get caught up in the little swale which forms the left fringe of the green and presents a very difficult "up and down", particularly if the flag is also on the left of the green.